Big skies, blue seas and miles upon miles of agricultural countryside, Norfolk is a veritable glamping haven. 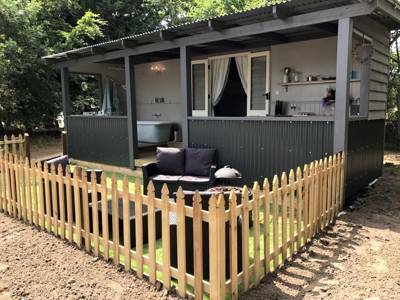 With more than its fair share of glamping sites it’s a real heartland for glampers in the south east of England looking for a weekend away or a longer summer glamping holiday. With the exception of mountains, it is a region that has it all – miles of beaches, a dynamic coast, marshes and woodland. 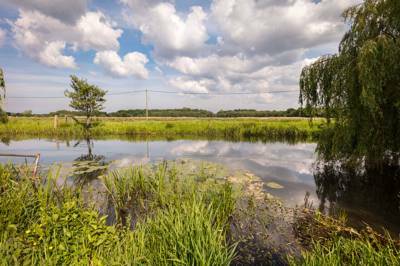 There are quiet inland roads which are perfect for cycling, excellent footpaths for walking and a vast network of rivers and waterways that wiggle their way through the fens and The Broads. 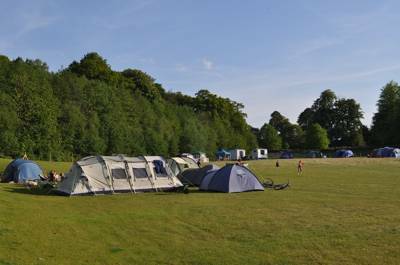 This variety of landscape means glampers can choose from canalside campsites, sites with sea views, woodland hideaways and glamping in the open countryside. 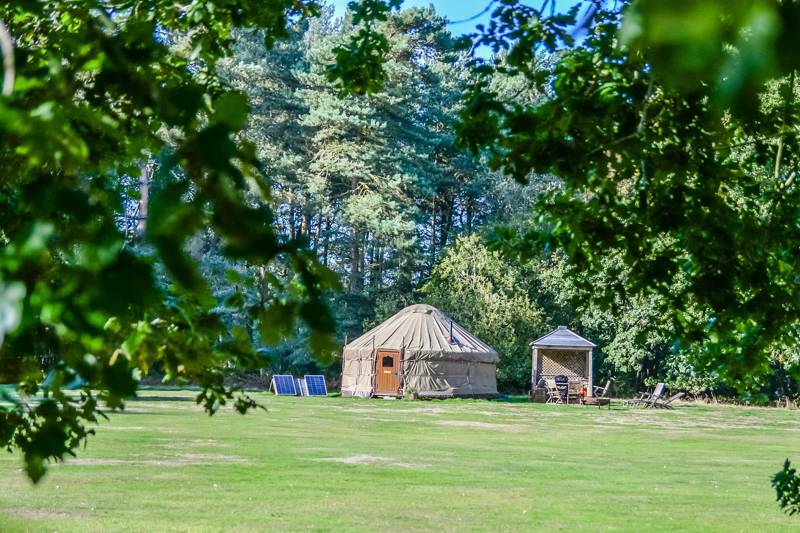 Whether you want to spend time on the glorious sandy beaches or fancy a peaceful woodland retreat, our choice of glamping sites in Norfolk should have something to suit you. 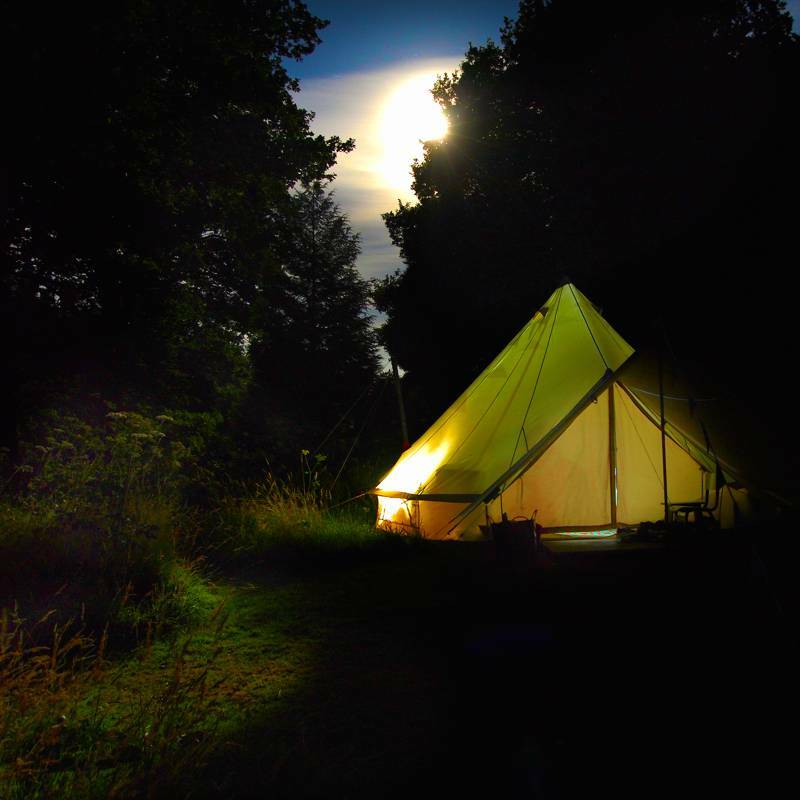 The variety of glamping accommodation in Norfolk is as vast as the locations you’ll find it in. Each site in the Cool Camping collection is unique. Our experts have handpicked places that offer special stays – from simple bell tents to elaborate woodland cabins with all mod cons. When choosing your holiday, you might select the Norfolk destination or attraction you want to be close to, then check what glamping accommodation is available nearby or you might have your heart set on a particular type of glamping accommodation. Perhaps you want a romantic stay in a shepherd’s hut or a magical family getaway in a traditional tipi. 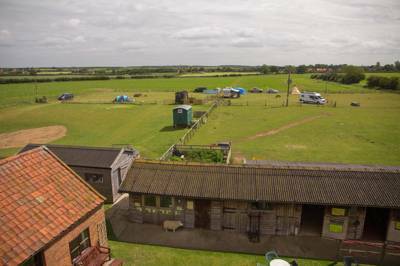 Thanks to the wide range of glamping accommodation available among our Norfolk glamping collection, all are possible. 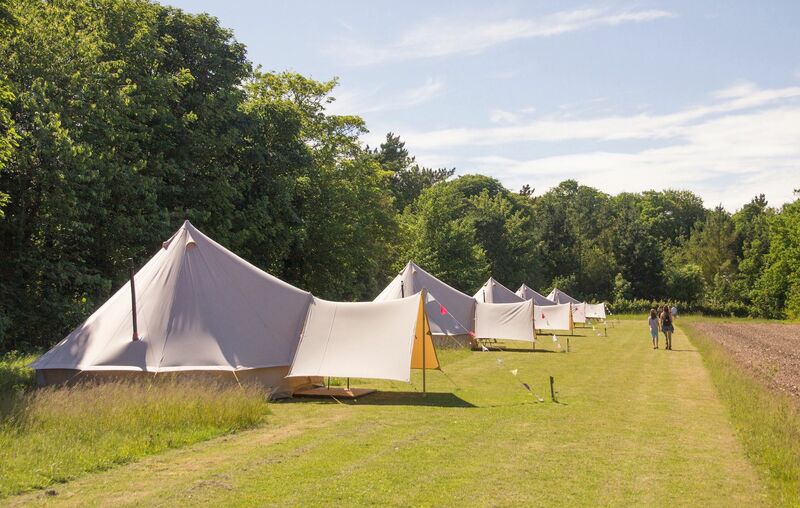 Along the coast, bell tent glamping is particularly popular. Here, many glamping sites pop-up for the duration of the summer and offer simple bell tent glamping that capitalises on the seaside location. Yet bell tents are just the tip of the iceberg. There are luxury, en-suite shepherd’s huts with all the bells and whistles, gleaming Airstream caravans, yurts, romantic gypsy caravans and even tree-houses. Norfolk really is a glamper's dream and are all on offer if you know where to look. And that’s where we at Cool Camping come in. We’ve been up and down the county finding, what we believe are the very best glamping sites in Norfolk. The price, the size, the accommodation type aren't what matter either. What we look for is best summed up with that famous French phrase, je ne sais quoi. We look for glamping sites with that certain something that makes them stand out - and every one on our list is a corker! Norfolk’s seaside resorts have long made it a firm favourite for family holidays and there are plenty of campsites to cater for the crowds who come for the coast, countryside, beaches and The Broads. Our travel experts look beyond the holiday parks and the large-scale camping sites for places that offer something a little bit special; nowhere is that more apparent than in our carefully-chosen glamping sites. Almost all of them are suitable for families so if you haven’t taken the kids on a glamping holiday yet, Norfolk is a great place to start. If the Cool Camping travel experts’ experience is anything to go by, glamping will be a hit with your kids; they love the time spent outdoors and the usually pint-sized proportions of shepherd’s huts, safari tents and fairytale treehouses. Glamping offers all the excitement of a camping holiday with a lot more convenience and comfort. It’s the perfect introduction to camping and offers an easier option if you just fancy a break from hammering in the tent pegs and untangling guy ropes. And for families with mixed feelings about camping, glamping is the ultimate halfway house as it can keep both outdoor enthusiasts and luxury lovers happy. In terms of family-friendly attractions and things to do, Norfolk is hard to beat. For starters there’s the seaside. You’ll find fun fair rides, amusements and crazy golf in seaside resorts of Great Yarmouth and Hunstanton with lower key seaside charm in places like Wells-next-the-Sea, Cromer and Sheringham. With miles and miles of sandy beaches, buckets and spades can be put to good use and for kids who love animals, you can head for Blakeney Point and a boat trip to see seals. Norfolk’s reputation as a family-friendly holiday hotspot also means there are plenty of man-made attractions designed to keep you busy from Roar! Dinosaur Adventure to BeWilderwood, woodland adventure theme park. Inland, Thetford Forest is a family-friendly location that’s easier to reach from most parts of the country (by Norfolk standards, at least). It’s the UK’s largest manmade lowland forest and among the pines there’s family-friendly cycling and walking tracks as well as Go Ape! treetop adventure. With wild windswept beaches, quirky market towns, glorious gardens, grand houses and produce that’s fresh from fishermen and the farm, Norfolk is as alluring to adults as it is to kids. Combine the tempting destinations with cosy glamping accommodation and you have the makings of a romantic retreat that’ll melt the stoniest of hearts. By day, you can walk hand-in-hand on the vast sands, meander along peaceful waterways, explore historic sites or watch wildlife. And by night, you can cook up a romantic meal for two on the campfire at your glamping site before watching the stars or getting cosy in your cabin, shepherd’s hut or gypsy caravan. For some people, taking time out from all mod cons and staying away from the distractions of modern life is as romantic as it comes while for others a little luxury is needed for real relaxation. 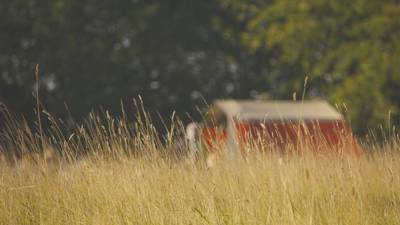 You’ll find the full range among our collection of glamping sites from bell tents where there’s no chance of charging a mobile phone to shepherd’s huts with log burners and hot tubs. The wide, flat beaches of Norfolk are a hint to the time when it was connected to the rest of Europe many millions of years ago, when animals could walk across the now submerged Dogger Bank that bridged the North Sea to the Netherlands. Human communities have existed in Norfolk since the last ice age but it was only when the Iceni tribe were booted out by the Roman conquest in 43 AD that the likes of hard roads, forts, villas and towns were built. Many created the foundations of routes that stand to this day, notable for their straight, directness across the landscape. After the Romans, Norfolk became a part of the Kingdom of East Anglia, until the Normans, when Norwich emerged as the central hub of the region, complete with its mighty castle. Norwich grew steadily and became an important medieval city as the county surrounding it became the most productive agricultural region in the country. To this day, farming remains at the core of the county’s offering. Vegetables, cereals, dairy herds and pigs all populate the countryside, with old water and wind mills dotted among the meadows, while tourism too, makes for much of the coastal trade. The harbours offer the important landing place for mussels, crab and fish – and were also once the key transport areas for barley – while, inland, the scattering of great country houses, including the Queen’s estate at Sandringham, show that even the lords and ladies of days gone by yearned to call Norfolk their home. Apart from the Queen’s rural retreat at Sandringham, the jewel in Norfolk’s crown is its stunning 90-mile coast. Outside the big seaside resorts it’s almost all been designated as an Area of Outstanding Natural Beauty (including, in fact, Sandringham itself). It’s the windswept and sea-washed scenery of sand and shingle expanses backed by marsh, heath and woodland that make it so special. There’s simply nowhere else quite like it and a variety of rare flora and fauna are supported by its various habitats. It’s especially good for birds and there are particular hotspots at the RSPB’s Snettisham and Titchwell Marshes and the National Trust’s Blakeney National Nature Reserve where you can also see seals. Boats depart daily from Morston Quay to the best vantage points. The Norfolk Coast Path takes in most of the coastline from Old Hunstanton in the north to Great Yarmouth in the south and provides well-signposted walking here. All along the coast, there are harbour towns and seaside resorts that are bustling with visitors in the summer months. For amusements and non-stop entertainment, there’s the big resorts at Hunstanton and Great Yarmouth. Cromer and Sheringham also have their fair share of mostly more old-fashioned fun with crabbing off the pier at Cromer and a heritage railway at Sheringham. Wells-next-the-Sea is one of the most attractive coastal harbour towns making it a popular place to visit. Its family-friendly sands and shallows are backed by a row of iconic and much-photographed beach huts and it’s just a few miles from Holkham which is a little wilder with huge expanses of sand backed by dunes and a pine woodland. Often referred to as the Norfolk Broads, the waterways that dominate the southern half of the county are, in fact, part of a national park that straddles both Norfolk and neighbouring Suffolk. The Broads National Park includes seven rivers and 60 Broads – created when rising sea waters flooded medieval peat pits. Now it’s Britain’s largest wetland reserve and there are 125 miles of navigable waterways which are popular for boating of all types; from motorboating to canoeing. There are countless other ways to enjoy the waterways including walking, running, cycling and wildlife-watching alongside them as well as fishing and swimming in them. This unique environment is a special habitat for many animals and it’s home to some of Britain’s rarest wildlife. Choose glamping in the Norfolk Broads and you can set up home alongside them and enjoy the tranquility of this special environment. Some of the most popular spots in The Broads area include Waxham, which is ideally situated on the coast and within a few miles of Hickling Broad, the largest of the lot. Waxham's sandy beach runs north to Sea Palling where there are family-friendly facilities and south to Horsey where you can often see seals on the beach. There’s a windmill, a common feature of Broads’ scenery, at Horsey which is open to the public thanks to the National Trust and from where you can join wildlife-watching trips along the waterways. Another popular Broad is at Whitlingham on the outskirts of Norwich and linked to it via the River Wentsum. The historic cathedral city of Norwich is, in fact, the only city within a national park within the UK and helps make a glamping city break both possible and attractive. – Eat fresh fish and chips on Cromer pier. – Explore the Queen's second home at Sandringham. – Rent a boat and take a day out in The Broads National Park. – Discover the museums, galleries and eateries of vibrant Norwich city. – Catch crabs off the quay at Wells-next-the-Sea. 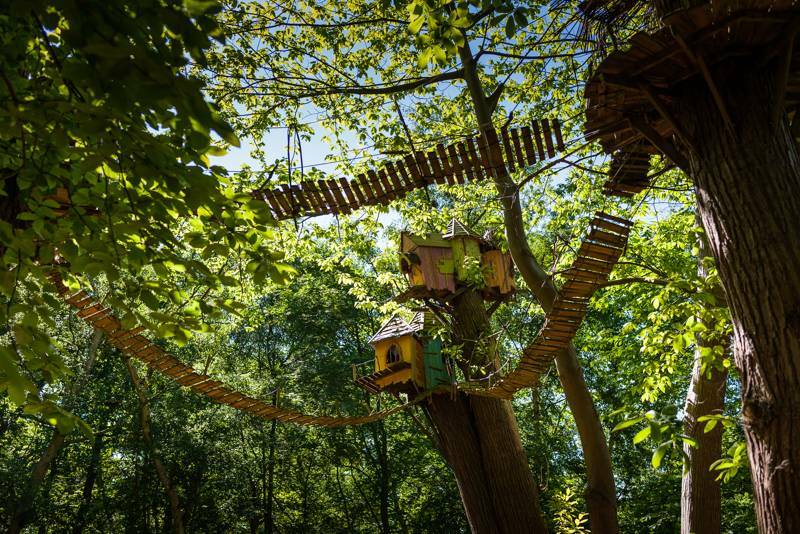 – Cycle through the trees at Thetford Forest Park. – Break out the binoculars for some birdwatching at a Norfolk nature reserve. – Hop on a boat out to see the grey seal colony at Blakeney Point. 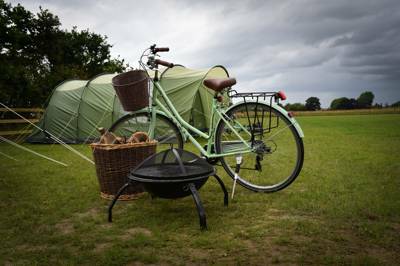 Glamping sites in Norfolk, Norfolk glampsites, Norfolk glamping, Norfolk glampsites at Glamping in Norfolk, Discover the very best glamping sites in Norfolk, from bell tents on the North Norfolk coast to romantic shepherd's huts in the forest. Find them all here and book online for the best price.